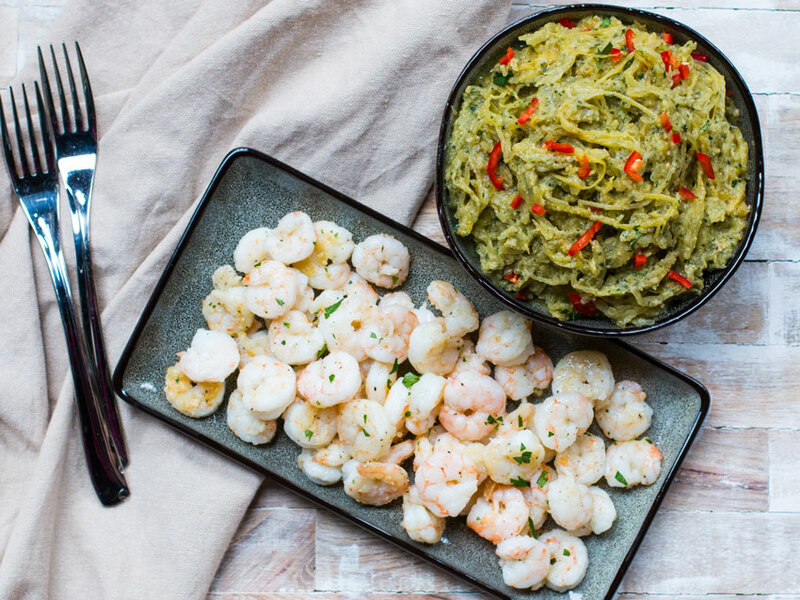 This healthy meal prep recipe features oven baked spaghetti squash tossed with homemade pesto sauce and served with juicy pan seared shrimps. 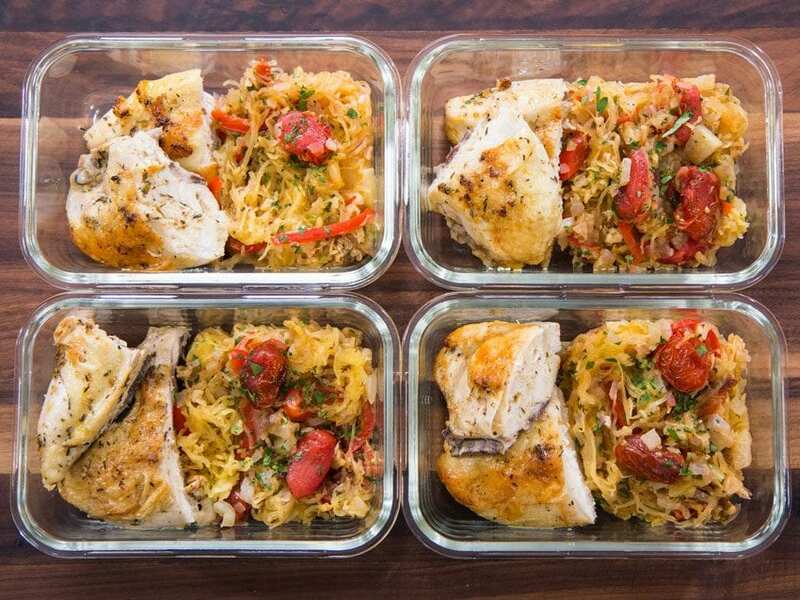 It's an easy and tasty recipe to try out for meal prep. If you are looking to mix up your meal prep rotation and try some easy and healthy meal ideas, then you gotta try these baked spaghetti squash recipe that is tossed in a homemade creamy ricotta cheese pesto sauce. It’s a great low carb sub for starchy noodles and its paired with juicy pan seared shrimp. Don’t be intimated by spaghetti squash. It may look like a football and the mere idea of cutting it open scares you, but if you follow my technique, you will be good to go. First, safely cut the spaghetti squash in half lengthwise. Check how I do this in the video below, I like to use a chefs knife and tap it down through the spaghetti squash using a rolling pin. It is the safest way I know to do this and it won’t damage the knife, so don’t worry. 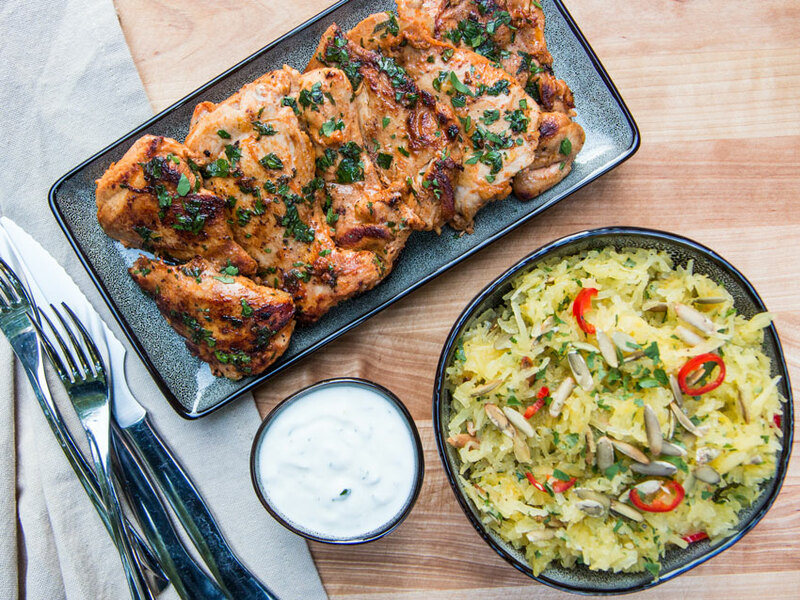 You can use this same technique in my other meal prep recipes that feature spaghetti squash like the Greek chicken recipe and these yogurt marinated chicken thighs. Bake the spaghetti squash in the oven for roughly 75 minutes. When you can easily pierce the squash with a knife, it is ready. You will need to allow the squash to rest for 10 minutes because it’s too hot to handle and then use a fork to pull the strands of spaghetti out of the squash. It’s a magic and low carb dream come true. Now you can toss the squash with the pesto sauce, garnish with the chiles, and enjoy! This baked spaghetti squash recipe makes enough for 5 days and can be stored in the fridge. Avoid freezing the spaghetti squash as it will be very mushy and watery when defrosted. The best way to reheat the spaghetti squash and pesto is in a hot pan over medium heat. If you are at work, you can cover the meal prep container with a wet paper towel and microwave in intervals of 30 seconds making sure not to overheat the squash and dry it out. Cooked shrimp can only be kept in the refrigerator for 3 days. Otherwise you will have to freeze them which I don’t recommend. Frozen shrimp almost always get overcook when reheated, and ends up being tough and rubbery. You can store uncooked shrimp in the fridge for 1-2 days in the coldest part of your fridge. Make sure to pat the shrimp very dry before seasoning and cooking. Otherwise they won’t get crusty when cooked. This meal prep recipe has perfectly cooked shrimp served with baked spaghetti squash tossed in creamy ricotta cheese pesto sauce. Pre-heat oven to 400 degrees F. Carefully cut the squash in half from top to bottom using a knife and a rolling pin. Watch the video below to see how I safely do this. Scoop out the seeds and save them for roasting and snacking while watching Netflix. Season the inside of the squash with a drizzle of oil and a generous pinch of salt and a few cracks of pepper. Roast on a sheet tray, cut side up, for 60-70 minutes or until the flesh can easily be pierced with a knife. Set aside so the squash can cool a bit. While the squash is cooking, make the pesto by add the walnuts to a food processor and pulse for 10 seconds. Add the remaining ingredients except the ricotta, pecorino, and olive oil, run the processor until everything is well combined, about 10-15 seconds. With the machine running, slowly add enough olive oil until the mixture is smooth, loose, and creamy. Add the ricotta and pecorino cheese and process another 10 seconds. Turn the machine off and taste the pesto, it might need more cheese or lemon juice. If the consistency is dry, add more oil while the machine is running. Set aside. Once the squash has cooled a bit, use a fork to rake the surface from top to bottom. 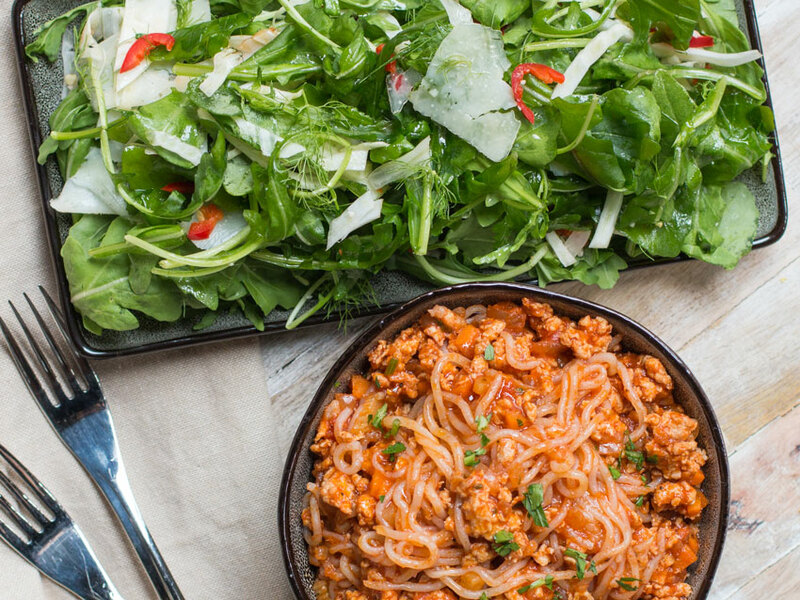 Place all the spaghetti strands in a large bowl. Add enough pesto to thoroughly coat the squash and mix well. Finely slice the chile pepper and add that to the spaghetti, or add a pinch of red pepper flakes. Check for seasoning, you will likely need a squeeze of lemon juice and maybe a pinch of salt. Set aside. For the shrimp, pre-heat a large cast iron pan over medium-high heat for 2 minutes with 2 teaspoons of oil. Make sure the shrimp are very dry, otherwise pat dry with paper towels, and season half of the shrimp with ½ teaspoon oil, a nice pinch of salt, and a few cracks of pepper. Cook the shrimp for 2 minutes on the first side, flip, and only cook 1-2 minutes on the second side. Remove shrimp from pan, season the second batch and cook them. 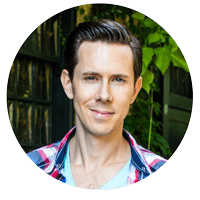 Overcooked shrimp are rubbery and taste like crap, make sure not to do that. 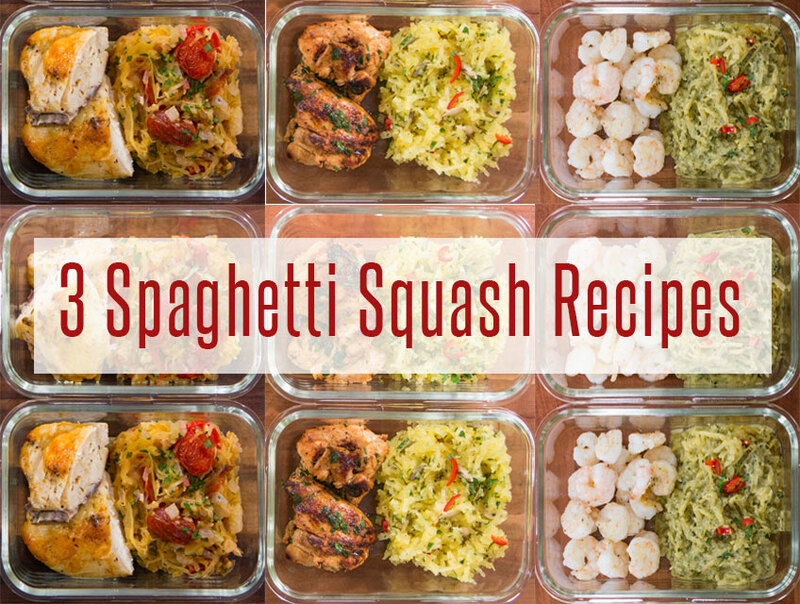 Serve the squash pesto with the shrimp and enjoy! The squash pesto will last in the fridge for 5 days, but can’t be frozen and the shrimp will last for 3 days in the fridge. Make more shrimp on day 3 or freeze some, although I don’t like frozen shrimp, they get rubbery. 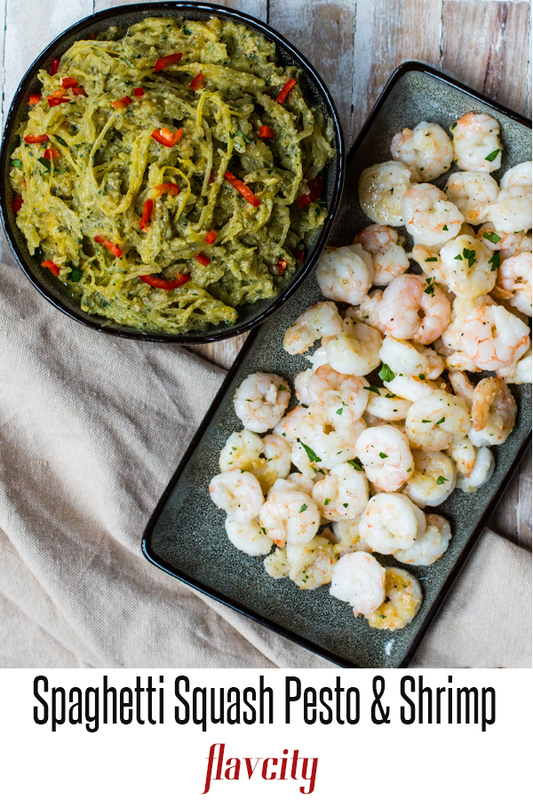 The best way to reheat the squash pesto and shrimp is in a hot non-stick pan for a few minutes, otherwise cover the container with a wet paper towel and gently reheat in the microwave, making sure not to overcook the shrimp. Can you do a keto friendly Lasagna maybe out of Zuchinni? My husband and I are beginners and he loves pasta so it would be great to do an alternative.